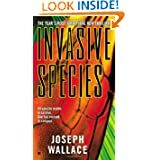 Invasive Species by Joseph Wallace could have been a top notched story in my opinion, but it needed a little more work in the developing stage. Some parts were downright creepy and definitely raised the heart rate as I tried to imagine what life would be like was something like this to happen in real life. Unlike some reviewers I read before purchasing this novel I had no problem suspending disbelief. It was easy to visualize the wasps and the terror they brought to a people totally unprepared to deal with them. The story opens in the African wilderness where a rainforest is dying out. An unknown predator, an enormous black wasp, is forced to rise up and find new territory to call home. Before their native land was destroyed, these wasps, known by the locals as ‘Thieves’ preyed on animals, typically monkeys. The animals were used as a host for their growing larvae, an ordeal the host didn’t survive. These thieves had no problem moving from monkeys to people as they quickly spread out, deadlier than anything the world has ever known. Where I think the novel failed was in character development. It was spread out too thin across too many characters and I wasn’t able to develop a strong enough emotional connection to most of them to remember what part they played. The political side, heavier handed than I prefer, didn’t do anything to add to the story either. I craved more time shown with the wasps as an actual part of the scene. I did find it easy to connect with the little girl Cait, and also with Trey, the man who first came into contact with the wasps, but the rest were just vague images in my mind. The ending also fell flat. I won’t get into it because I don’t want to give anything away. Not everyone will feel the same way I did. Bottom line, it’s a good read with loads of potential, but is let down by a lack of character development. I still enjoyed the story and would score it 3.5 out of 5 stars if I could. Posted by Denna Holm on January 5, 2014 in Archives and tagged chilling, Horror, tense, thriller.